"Klug is a UCC-Congregationalist minister, and his poems are often explicit about faith, but to call him a religious poet minimizes his merits. . . . Klug’s versions of Catullus, Virgil, and a marvelous, profane Horace are 'after' these poets in at least two senses—the ordinary linguistic sense and the sense of honoring and carrying on a tradition of poetic perception as those secular Roman poets are resurrected under the pen of a contemporary American Christian. In every poem, Klug makes every syllable count. Every punctuation mark qualifies, securing each clause in the form, and when a poem is unpunctuated, the omission is calculated, intentional. Klug looks like a minimalist, but his minimalism concentrates, burnishes: 'hills fuzzed with a concentration of mist / so pale it cannot be darkness, then it is.' Here the visual is rendered sonically, so perfectly one wants to involve the rest of the senses, to speak the lines, to taste the syllables. Not to be missed." "To the poetic imagination, the world isn't described through poetry; it is poetry, at least when the world is seen most clearly and truthfully. Klug's work offers exactly this kind of reorienting of perspective, showing us the world in all of its particularity and with all of its resonances." "Anyone is a blade of a book. . . . Klug’s aesthetic is a study in what restraint can open--and I want to call his poems perfect now, not as compared to anything else, but because they couldn’t be another way, perfect in themselves. . . . While Bishop’s presiding metaphor is the shell, Klug’s is the edge: both as what cuts-through and as what’s in-between. As in Bishop, the reader is shown everything and has the nagging sense that what is most important has been withheld." "I can’t get Nate Klug’s spare, clear poems out of my head, and thank God for that. I would say that he is at the beginning of a great career, but that sells this book short, which seems to me to already have elements of greatness. Anyone interested in poetry, regardless of camp or creed, is going to want to own this book." 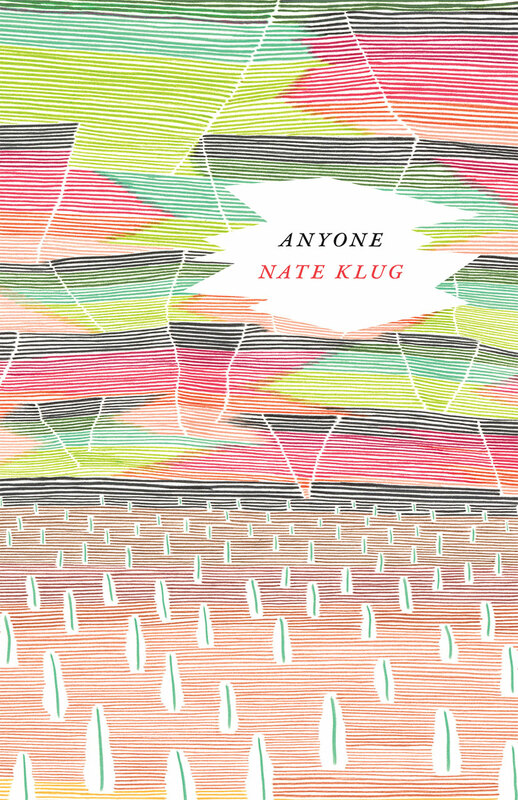 "Nate Klug’s Anyone is a searching book. Its voice is quiet, vibrant, musical, and steadily, unusually, egoless. A hundred years from now someone—perhaps anyone—who wanted to know what it is like to perceive and feel, think and believe, in our times could find the answer in these poems, so touched by the past, so alert to the world in and around them. Like George Herbert’s "virtue," they shine both in the day and in the night." "Klug's poems are like containers catching rain, ping by ping, they have perfect sound patterns made by the formation of a water they create themselves falling in. The Merton-Zukovsky epigraph at the start—‘In the whole that is unnecessary, every small thing becomes necessary’—perfectly captures the background for such finely tuned poems, as necessary as rain." "Klug chooses a different route, eluding efforts to read his work as biography in favor of a more generalized presentation of thought and experience that could occur to anyone. He creates a sort of vacant space for the reader to step into. And the reader does step in"